I don’t own an AR-15. I’m not a “gun person,” whatever that means. I hardly ever shoot. And I never hunt. 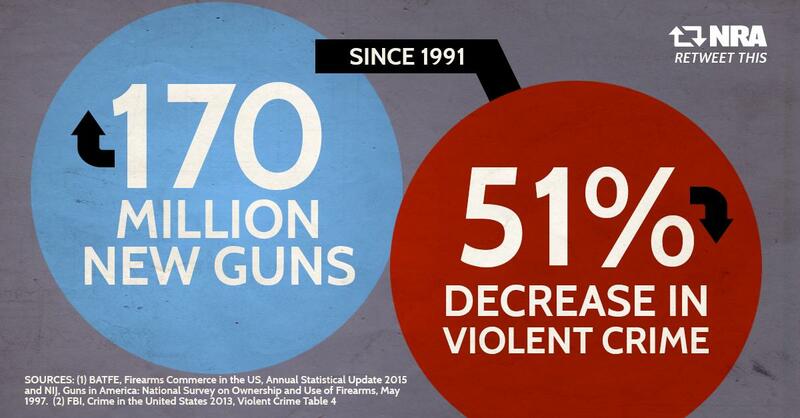 But I’m nonetheless a big supporter of private gun ownership. In part, this is because I have a libertarian belief in civil liberties. In other words, my default assumption is that people should have freedom (the notion of “negative liberty“), whereas many folks on the left have a default assumption for that the state should determine what’s allowed. I also support private gun ownership because I want a safer society. Criminals and other bad people are less likely to engage in mayhem if they know potential victims can defend themselves. And I also think that there’s a greater-than-zero chance that bad government policy eventually will lead to periodic breakdowns of civil society, in which case gun owners will be the last line of defense for law and order. I’m sometimes asked, though, whether supporters of the 2nd Amendment are too rigid. Shouldn’t the NRA and other groups support proposals for “common-sense gun safety”? Some of these gun-control ideas may even sound reasonable, but they all suffer from a common flaw. None of them would disarm criminals or reduce gun crime. And I’ve detected a very troubling pattern, namely that when you explain why these schemes won’t work, the knee-jerk response from the anti-gun crowd is that we then need greater levels of control. Indeed, if you press them on the issue, they’ll often admit that their real goal is gun confiscation. Though most folks in leadership positions on the left are crafty enough that they try to hide this extreme view. So that’s why – in a perverse way – I want to applaud John Paul Stevens, the former Supreme Court Justice, for his column in the New York Times that openly and explicitly argues for the repeal of the 2nd Amendment. …demonstrators should…demand a repeal of the Second Amendment. …that amendment…is a relic of the 18th century. …to get rid of the Second Amendment would be simple and would do more to weaken the N.R.A.’s ability to stymie legislative debate and block constructive gun control legislation than any other available option. …That simple but dramatic action would…eliminate the only legal rule that protects sellers of firearms in the United States. The reason I’m semi-applauding Stevens is that he’s an honest leftist. He’s bluntly urging that we jettison part of the Bill of Rights. Many – if not most – people on the left want that outcome. And a growing number of the are coming out of the pro-confiscation closet. In an article for Commentary, Noah Rothman links to several articles urging repeal of the 2nd Amendment. They’re talking about repealing the Second Amendment. It started with former Supreme Court Justice John Paul Stevens and George Washington University Law Professor Jonathan Turley. …Turley and Stevens were joined this week by op-ed writers in the pages of Esquire and the Seattle Times. Democratic candidates for federal office have even enlisted in the ranksvvvvvvvv of those calling for an amendment to curtail the freedoms in the Bill of Rights. 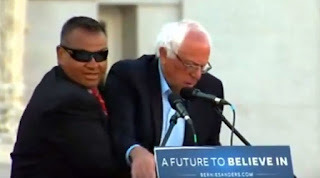 …anti-Second Amendment themes…have been expressed unashamedly for years, from liberal activists like Michael Moore to conservative opinion writers at the New York Times. Those calling for the repeal of the right to bear arms today are only echoing similar calls made years ago in venues ranging from Rolling Stone, MSNBC, and Vanity Fair to the Jesuit publication America Magazine. But others on the left prefer to hide their views on the issue. Indeed, they even want to hide the views of their fellow travelers. Chris Cuomo, who has a show on MSNBC, preposterously asserted that nobody supports repeal of the 2nd Amendment. It’s also worth noting that Justice Stevens got scolded by a gun-control advocate at the Washington Post. One of the biggest threats to the recovery of the Democratic Party these days is overreach. …But rarely do we see such an unhelpful, untimely and fanciful idea as the one put forward by retired Supreme Court justice John Paul Stevens. …Stevens calls for a repeal of the Second Amendment. The move might as well be considered an in-kind contribution to the National Rifle Association, to Republicans’ efforts to keep the House and Senate in 2018, and to President Trump’s 2020 reelection bid. In one fell swoop, Stevens has lent credence to the talking point that the left really just wants to get rid of gun ownership. …This is exactly the kind of thing that motivates the right and signals to working-class swing voters that perhaps the Democratic Party and the political left doesn’t really get them. The bottom line is that the left’s ultimate goal is gutting the 2nd Amendment. Not much doubt of that, even if some leftists are politically savvy enough to understand that their extremist policy is politically suicidal. But let’s set aside the politics and look at the legal issues. There’s another reason why I’m perversely happy about the Stevens oped. Even though he was on the wrong side of the case, he effectively admits that the 2008 Heller decision enshrined and upheld the individual right to own firearms. And the five Justices who out-voted Stevens made the right decision. I’m not a legal expert, so I’ll simply cite some people who are very competent to discuss the issue. Starting with what Damon Root wrote for Reason. One problem with Stevens’ position is that he is dead wrong about the legal history. …For example, consider how the Second Amendment was treated in St. George Tucker’s 1803 View of the Constitution of the United States, which was the first extended analysis and commentary published about the Constitution. For generations of law students, lawyers, and judges, Tucker’s View served as a go-to con-law textbook. …He observed the debates over the ratification of the Constitution and the Bill of Rights as they happened. And he had no doubt that the Second Amendment secured an individual right of the “nonmilitary” type. “This may be considered as the true palladium of liberty,” Tucker wrote of the Second Amendment. “The right of self-defense is the first law of nature.” In other words, the Heller majority’s view of the Second Amendment is as old and venerable as the amendment itself. Though the real hero of this story is probably Joyce Lee Malcolm, the scholar whose work was instrumental in producing the Heller decision. John Miller explains for National Review. Malcolm looks nothing like a hardened veteran of the gun-control wars. Small, slender, and bookish, she’s a wisp of a woman who enjoys plunging into archives and sitting through panel discussions at academic conferences. Her favorite topic is 17th- and 18th-century Anglo-American history… She doesn’t belong to the National Rifle Association, nor does she hunt. …She is also the lady who saved the Second Amendment — a scholar whose work helped make possible the Supreme Court’s landmark Heller decision, which in 2008 recognized an individual right to possess a firearm. Ms. Malcolm started as a traditional academic. For her dissertation, she moved to Oxford and Cambridge, with children in tow. …Malcolm’s doctoral dissertation focused on King Charles I and the problem of loyalty in the 1640s… The Royal Historical Society published her first book. But her subsequent research uncovered some fascinating insights about the right to keep and bear arms. And it turns out that careful scholarship can produce profound results. …in 2008, came Heller, arguably the most important gun-rights case in U.S. history. A 5–4 decision written by Scalia and citing Malcolm three times, it swept away the claims of gun-control theorists and declared that Americans enjoy an individual right to gun ownership. “…it gave us this substantial right.” She remembers a thought from the day the Court ruled: “If I have done nothing else my whole life, I have accomplished something important.” …the right to bear arms will not be infringed — thanks in part to the pioneering scholarship of Joyce Lee Malcolm. Let’s close with a video from Prager University, narrated by Eugene Volokh, a law professor at UCLA. He explains the legal and historical meaning of the 2nd Amendment. In other words, the bottom line is that the Justice Stevens and other honest leftists are right. The 2nd Amendment would need to be repealed in order to impose meaningful gun control. And I suppose it’s also worth mentioning that it won’t be easy to ban and confiscate guns if they ever succeeded in weakening the Bill of Rights. But hopefully we’ll never get to that stage. Obama CIA director John Brennan, a subject of ongoing analysis at The American Spectator, recently uncorked an epic Twitter rant. Enraged by President Trump’s words aimed at FBI deputy director Andrew McCabe, Brennan steamed at the president: “When the full extent of your venality, moral turpitude, and political corruption becomes known, you will take your rightful place as a disgraced demagogue in the dustbin of history. You may scapegoat Andy McCabe, but you will not destroy America … America will triumph over you. Adult sponsors of companies sign on to bullying a conservative commentator off the air. Hogg, who has made extensive use of his First Amendment free speech rights, immediately turns around and demands that a free press that displeases him — Ingraham’s Fox News show — be “boycotted” by advertisers. Immediately the adults who sponsor Ingraham’s show stand up and do his bidding. Let’s start with this interesting story you won’t see anywhere else. A Los Angeles judge has determined that coffee companies must carry an ominous cancer warning label because of a chemical produced in the roasting process. Superior Court Judge Elihu Berle said Wednesday that Starbucks and other companies failed to show that benefits from drinking coffee outweighed any risks. He ruled in an earlier phase of trial that companies hadn’t shown the threat from the chemical was insignificant. The Council for Education and Research on Toxics, a nonprofit group, sued Starbucks and 90 other companies under a state law that requires warnings on a wide range of chemicals that can cause cancer. One is acrylamide, a carcinogen present in coffee. My Take - We need to understand that a huge number of foods test carcinogenic. But testing carcinogenic and causing cancer are two different things. Testing carcinogenic under the current standard isn't necessarily even carcinogenic. They feed massive amounts of a compound to rodents that are genetically prone to grow tumors and then declare something carcinogenic when the grow tumors. And when the EPA was challenged this wasn’t good science the EPA claim these determinations aren’t a matter of science but of EPA policy. Well if their policy isn't based on science, what is it based on? How sharper than a serpent's tooth to have a despotic pediatric dentist. Parents who decide, for whatever reason, that they don't like their children's oral care provider should be forewarned. Empowered by government "mandatory reporter" laws, dental offices are now using their authority to threaten families with child abuse charges if they don't comply with the cavity police. South Africa’s ANC regime is about to pass a draconian piece of legislation on “hate speech” directly aimed at whites. However, even before “The Prevention and Combating of Hate Crime and Hate Speech Bill” could become law, a minor district judge or “magistrate” in Randburg, a suburb of Johannesburg, sentenced Vicki Momberg to an effective two years prison sentence for using the “K-word” in an altercation with a black policeman. “Teased out by legal experts.” Yes, sure. If you’re white, you insult or complain to a black official at your peril. Thanks to affirmative action, the entire state bureaucracy is loaded with officials who are hardly literate, whether in the police, the court system, or at the Internal Revenue Service. Given Social Security’s enormous long-run financial problems, the program eventually will need reform. But what should be done? 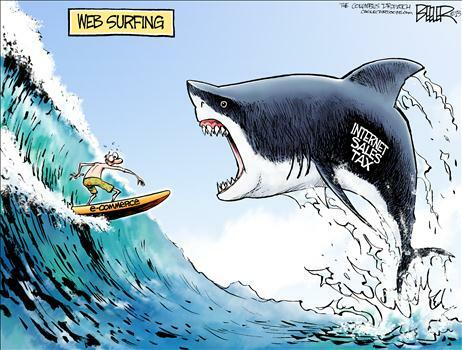 Some folks on the left, such as Barack Obama and Hillary Clinton, support huge tax increases to prop up the program. Such an approach would have a very negative impact on the economy and, because of built-in demographic changes, would merely delay the program’s bankruptcy. Others want a combination of tax increases and benefit cuts. This pay-more-get-less approach is somewhat more rational, but it means that today’s workers would get a really bad deal from Social Security. This is why I frequently point out that personal retirement accounts (i.e., a “funded” system based on real savings) are the best long-run solution. And to help the crowd in Washington understand why this is the best approach, I explain that dozens of nations already have adopted this type of reform. And I’ve written about the good results in some of these jurisdictions. Now it’s time to add Sweden to the list. I actually first wrote about the Swedish reform almost 20 years ago, in a study for the Heritage Foundation co-authored with an expert from Sweden. Here’s some of what we said about the nation’s partial privatization. Swedish policymakers decided that both individual workers and the overall economy would benefit if the old-age system were partially privatized. …Workers can invest 2.5 percentage points of the 18.5 percent of their income that they must set aside for retirement. …the larger part-16 percent of payroll-goes to the government portion of the program. …What makes the government pay-as-you-go portion of the pension program unique, however, is the formula used for calculating an individual’s future retirement benefits. Each worker’s 16 percent payroll tax is credited to an individual account, although the accounts are notional. …the government uses the money in these notional accounts to calculate an annuity (annual retirement benefit) for the worker. …the longer a worker stays in the workforce, the larger the annuity received. This reform is expected to discourage workers from retiring early… There are many benefits to Sweden’s new system, including greater incentives to work, increased national savings, a flexible retirement age, lower taxes and less government spending. While that study holds up very well, let’s look at more recent research so we can see how the Swedish system has performed. I’m a big fan of the fully privatized portion of the Swedish system (the “premium pension”) funded by the 2.5 percent of payroll that goes to personal accounts. But let’s first highlight the very good reform of the government’s portion of the retirement system. It’s still a tax-and-transfer scheme, but there are “notional” accounts, which means that benefits for retirees are now tied to how much they work and how much they pay into the system. A new study for the American Enterprise Institute, authored by James Capretta, explains the benefits of this approach. Sweden enacted a reform of its public pension system that combines a defined-contribution approach with a traditional pay-as-you-go financing structure. The new system includes better work incentives and is more transparent to participants. It is also permanently solvent due to provisions that automatically adjust payouts based on shifting demographic and economic factors. …A primary objective…in Sweden was to build a new system that would be solvent permanently within a fixed overall contribution rate. …pension benefits are calculated based on notional accounts, which are credited with 16.0 percent of workers’ creditable wages. …The pensions workers get in retirement are tied directly to the amount of contributions they make to the system. …This design improved incentives for work… To keep the system in balance, this rate of return is subject to adjustment, to correct for shifts in demographic and economic factors that affect what rate of return can be paid within the fixed budget constraint of a 16.0 percent contribution rate. The final part of the above excerpts is key. The system automatically adjusts, thus presumably averting the danger of future tax hikes. Now let’s look at some background on the privatized portion of the new system. Here’s a good explanation in a working paper from the Center for Fiscal Studies at Sweden’s Uppsala University. The Premium Pension was created mainly for three purposes. Firstly, funded individual accounts were believed to increase overall savings in Sweden. …Secondly, the policy makers wanted to allow participants to take account of the higher return in the capital markets as well as to tailor part of their pension to their risk preferences. Finally, an FDC scheme is inherently immune against financial instability, as an individual’s pension benefit is directly financed by her past accumulated contributions. The first investment selections in the Premium Pension plan took place in the fall of 2000, which is known as the “Big Bang” in Sweden’s financial sector. …any fund company licensed to do business in Sweden is allowed to participate in the system, but must first sign a contract with the Swedish Pensions Agency that specifies reporting requirements and the fee structure. Benefits in the Premium Pension Plan are paid out annually and can be withdrawn from age 61. 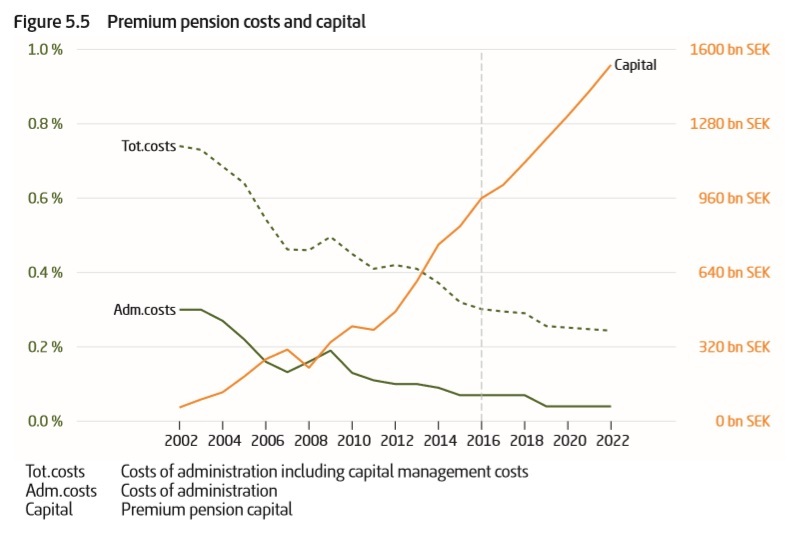 And here’s a chart from the Swedish Pension Agency’s annual report showing that pension assets are growing rapidly (right axis), in part because “premium pension has provided a 6.7 percent average value increase in people’s pensions per year since its launch.” Moreover, administrative costs (left axis) are continuously falling. Both trends are very good news for workers. Let’s close by citing another passage from Capretta’s AEI study. He looks at Sweden’s long-run fiscal outlook to other major European economies. According to European Union projections, Sweden’s total public pension obligations will equal 7.5 percent of GDP in 2060, which is a substantial reduction from the…8.9 percent of GDP it spent in 2013. …In 2060, EU countries are expected to spend 11.2 percent of GDP on pensions. Germany’s public pension spending is projected to increase…to 12.7 percent of GDP in 2060. …The EU forecast shows France’s pension obligations will be 12.1 percent of GDP in 2060 and Italy’s will be 13.8 percent of GDP. I think 8.9 percent of GDP is still far too high, but it’s better than diverting 11 percent, 12 percent, or 13 percent of economic output to pensions. And the fiscal burden of Sweden’s system could fall even more if lawmakers allowed workers to shift a greater share of their payroll taxes to personal accounts. But any journey begins with a first step. Sweden moved in the right direction. The United States could learn from that successful experience. P.S. Pension reform is just the tip of the iceberg. As I wrote two years ago, Sweden has implemented a wide range of pro-market reforms over the past few decades, including some very impressive spending restraint in the 1990s. If you’re interested in more information about these changes, check out Lotta Moberg’s video and Johan Norberg’s video. On March 18, 2018, the Washington Post Outlook section categorized KGB influence operations and my book, American Betrayal, both as “myth.” In response, I sent in the following essay, which Outlook has turned down. I am the author of that unnamed “book written in 2013” whose research and argumentation, anchored in nearly 1,000 endnotes, were labeled a “myth” by Mark Kramer (“Five Myths about Espionage,” Outlook, March 18, 2018). A surprisingly common misconception about spies is that they set out to change policy in the countries where they operate. A book published in 2013, for example, alleged that Stalin’s spies in the 1940s had effectively “occupied” the United States and guided the policies of the Roosevelt administration. Given that Kramer wrote an op-ed last year about the long history of “Moscow’s active measures to influence U.S. politics and undermine U.S. foreign policy,” perhaps it is his own recent Outlook statement that is surprising; however, it is no myth. That there exist “spies” — better known as agents of influence, for example — who seek to “change,” or, more realistically, influence policy-making and other activities of rival nations is a fact. It is an especially salient fact in the case of the fronts, networks and sophisticated campaigns of deception directed by the KGB, and overseen, at least in the post-Stalin era, as renowned Soviet dissident Vladimir Bukovsky reminds us, by the Central Committee of the Communist Party in Moscow. Lest there be any confusion, this has been going on for one hundred years — not only in “the 1940s.” My own book aside, I am afraid that when Mark Kramer, as director of Cold War Studies at Harvard, dismisses all of this and more as “myth,” it is akin to the Army Corps of Engineers dismissing as “myth” the presence of water in the Mississippi River. I am guessing deception is very rarely mentioned in textbooks on espionage that Professor Kramer assigns in his “Cold War Studies” courses. What follows, then, is a chance for him to bone up. An intelligence service has two main functions in a target country. One is to collect information from either classified or unclassified sources. The second is to influence the situation in that country. That power to influence policy has always been the ultimate purpose of the Communist Party’s infiltration. It was much more dangerous, and, as events have proved, much more difficult to detect, than espionage [stealing secrets], which beside it is trivial, though the two go hand and hand. There is nothing magical, let alone mythical, about any of this. Davis recounts a “special meeting” of the “comrades” — all federal employees in a secret sub-cell of the larger underground apparatus — called “to deal with” the shocking news of the show trials of the so-called Old Bolsheviks, i.e., Stalin’s blood purges. Vic announced that Steve had meant to come to Washington but the repercussions from the news were keeping him at headquarters. “Vic” is Soviet agent Victor Perlo, who, as key defector Elizabeth Bentley revealed, later ran his own ring (the Perlo group); “Steve” is the notorious Comintern spymaster better known as “J. Peters,” the link between the American underground and the Soviet secret police. That last bit is darkly fascinating. “John” is all but certainly John Abt, later chief counsel for the Communist Party USA. During the Moscow show trials (1936-1938), Abt had two notable “chiefs” whom he might well have been “allowed to try to recruit.” One was a U.S. Senate Chairman, the other the Attorney General. Whatever the identity of “John” and his “chief,” subject for a year to the ministrations of communist recruitment, the questions themselves attune us to the painstaking, long-range practice of such operations. Decades later, in the hands of Stanislav Levchenko, KGB defector and master-practitioner of influence operations, they were aptly likened to courtship. In a situation with few parallels in history, the agents of an enemy power were in a position to do much more than purloin documents. They were in a position to influence the nation’s foreign policy in the interests of the nation’s chief enemy, and not only on exceptional occasions, like Yalta (where Hiss’s role, while presumably important is still ill-defined) or through the Morgenthau Plan for the destruction of Germany (which is generally credited to [Harry Dexter] White), but in what must have been the staggering sum of day-to-day decisions. You can never overestimate the impact of an agent of influence. If you have an individual who is an adviser to a minister or a president, or if you have a minister himself as your agent of influence, you can do a tremendous amount in a country as far as actives measures are concerned. It is the most insidious, pernicious thing to deal with as far as a countermeasure is concerned. Just don’t expect college credit at Harvard for bringing any of this up in class. But the largest share by far of their personnel and resources goes toward the collection of secret information through human and technical espionage and the subsequent analysis of that information. This was just as true of the Soviet Union in the 1930s and ’40s as it is of the United States today. Influencing policy was rarely, if ever, their main goal — indeed, it was discouraged if it would raise red flags and thereby endanger access to classified materials. 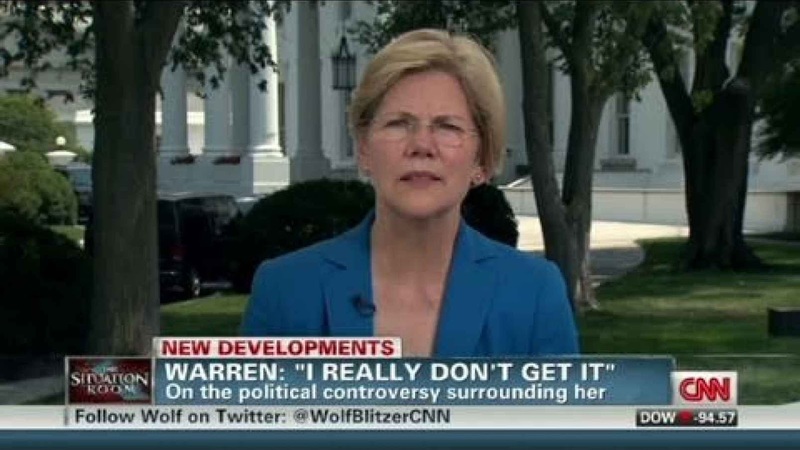 Saying so doesn’t make it so. As a policy wonk, I mostly care about the overall impact of government on prosperity. 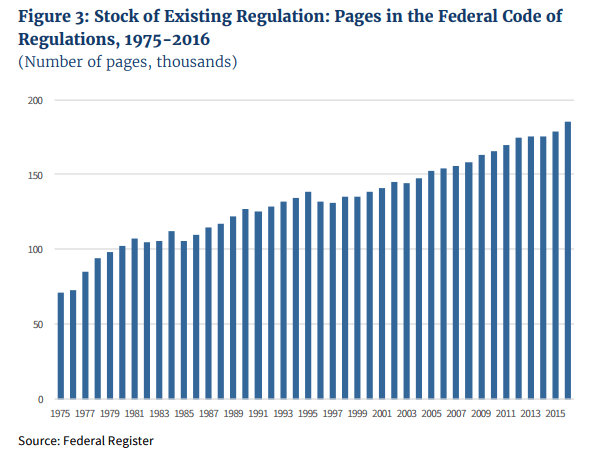 So when I think about the effect of red tape, I’m drawn to big-pictures assessments of the regulatory burden. Here are a few relevant numbers that get my juices flowing. The economy-wide cost of regulation reached $1.75 trillion in 2010. For every bureaucrat at a regulatory agency, 100 jobs are lost in the economy’s productive sector. 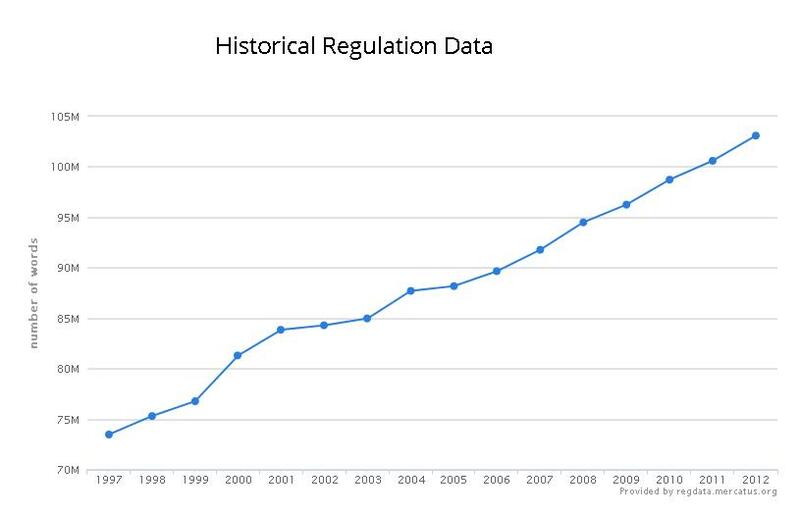 Regulatory increases since 1980 have reduced economic output by $4 trillion. The European Central Bank estimated that product market and employment regulation has led to costly “misallocation of labour and capital in eight macro-sectors,” and also found that reform could boost national income by more than six percent. But one thing I’ve learned over the years is that I’m not normal. Most people don’t get excited about these macro-type calculations. I certainly can sympathize. It’s galling that the clowns in Washington have made our existence less pleasant. Most people also are quite responsive to anecdotes about red tape. 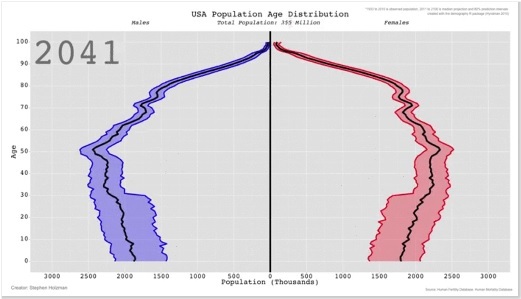 Simply stated, big-picture numbers are like a skeleton, while real-world examples put meat on the bones. 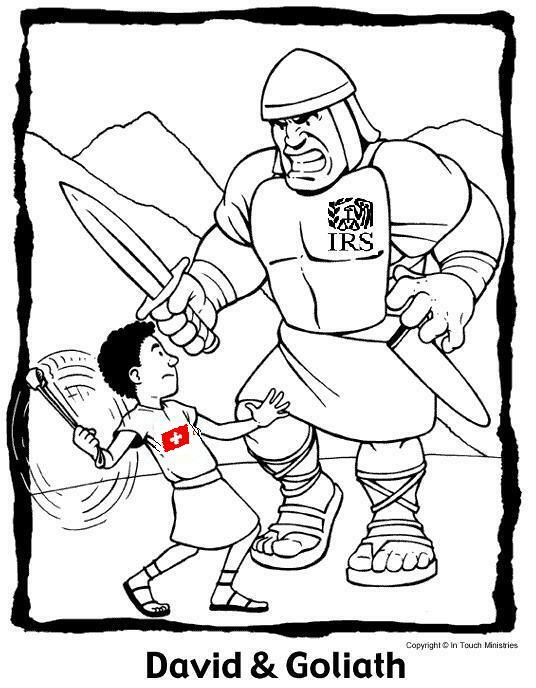 Today, let’s look at some absurd examples of the regulatory state in action. We’ll start with bone-headed pizza regulation, as explained by the Wall Street Journal. FDA released guidance for posting calorie disclosures at restaurants with more than 20 locations, and the ostensible point is to help folks choose healthier foods. The regulations…are an outgrowth of the 2010 Affordable Care Act… The reason some restaurants have spent years fighting these rules is not because executives lay awake at night plotting how to make Americans obese. It’s because the rules are loco. …Take pizza companies, which have to display per slice ranges or the number for the entire pie. Calories vary based on what you order—the barbarians who put pineapple on pizza are consuming fewer calories than someone who chooses pepperoni and extra cheese. But the number of pepperonis on a pizza depends on the pie’s size and whether someone also adds onions and sausage. ..The rules are so vague that companies could face a crush of lawsuits, which will be abetted by this “nonbinding” FDA guidance. By the way, you won’t be surprised to learn that academic researchers have found these types of rules have no effect on consumer choices. A systematic review and meta-analysis determined the effect of restaurant menu labeling on calories and nutrients…were collected in 2015, analyzed in 2016, and used to evaluate the effect of nutrition labeling on calories and nutrients ordered or consumed. Before and after menu labeling outcomes were used to determine weighted mean differences in calories, saturated fat, total fat, carbohydrate, and sodium ordered/consumed… Menu labeling resulted in no significant change in reported calories ordered/consumed… Menu labeling away-from-home did not result in change in quantity or quality, specifically for carbohydrates, total fat, saturated fat, or sodium, of calories consumed among U.S. adults. Shocking, just shocking. Next thing you know, somehow will tell us that Obamacare didn’t lower premiums for health insurance! For our second example, we have a surreal story out of California. A farmer faces trial in federal court this summer and a $2.8 million fine for failing to get a permit to plow his field and plant wheat in Tehama County. A lawyer for Duarte Nursery said the case is important because it could set a precedent requiring other farmers to obtain costly, time-consuming permits just to plow their fields. “The case is the first time that we’re aware of that says you need to get a (U.S. Army Corps of Engineers) permit to plow to grow crops,” said Anthony Francois, an attorney for the Pacific Legal Foundation. “We’re not going to produce much food under those kinds of regulations,” he said. …The Army did not claim Duarte violated the Endangered Species Act by destroying fairy shrimp or their habitat, Francois said. …Farmers plowing their fields are specifically exempt from the Clean Water Act rules forbidding discharging material into U.S. waters, Francois said. Wow, sort of reminds me of the guy who was hassled by the feds for building a pond on his own property. Or the family persecuted for building a house on their own property. Last but not least, our third example contains some jaw-dropping tidbits about red tape in a New York Times story. Indian Ladder Farms, a fifth-generation family operation near Albany, …sells homemade apple pies, fresh cider and warm doughnuts. …This fall, amid the rush of commerce — the apple harvest season accounts for about half of Indian Ladder’s annual revenue — federal investigators showed up. They wanted to check the farm’s compliance… Suddenly, the small office staff turned its focus away from making money to placating a government regulator. …The investigators hand delivered a notice and said they would be back the following week, when they asked to have 22 types of records available. The request included vehicle registrations, insurance documents and time sheets — reams of paper in all. …the Ten Eyck family, which owns the farm, along with the staff devoted about 40 hours to serving the investigators, who visited three times before closing the books. …This is life on the farm — and at businesses of all sorts. With thick rule books laying out food safety procedures, compliance costs in the tens of thousands of dollars and ever-changing standards from the government…, local produce growers are a textbook example of what many business owners describe as regulatory fatigue. 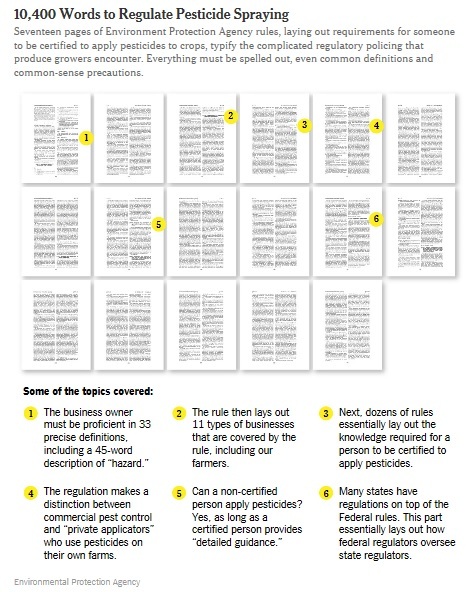 …The New York Times identified at least 17 federal regulations with about 5,000 restrictions and rules that were relevant to orchards. …Mr. Ten Eyck…fluently speaks the language of government compliance, rattling off acronyms that consume his time and resources, including E.P.A. (Environmental Protection Agency), OSHA (Occupational Safety and Health Administration), U.S.D.A. (United States Department of Agriculture) and state and local offices, too, like A.C.D.O.H. (Albany County Department of Health). And here’s an info-graphic that accompanied the article. Wow. No wonder a depressingly large share of the population prefers to simply get a job as a bureaucrat. Needless to say, this is not a system that encourages and enables entrepreneurship. Which is why deregulation is a good idea (and Trump deserves credit for making a bit of progress in this area). We need some sensible cost-benefit analysis so that bureaucracies are focused on public health rather than mindless rules. And it also would be a good idea in many cases to rely more on mutually reinforcing forms of private regulation. Since I’m a self-confessed wonk, I’ll close by sharing this measure of the ever-growing burden of red tape. I realize it’s not as attention-grabbing as anecdotes and horror stories, but it is very relevant if we care about long-run growth and competitiveness. P.S. On the topic of regulation, I admit that this example of left-wing humor about laissez-faire dystopia is very clever and amusing. P.P.S. I’ve used an apple orchard as an example when explaining why a tax bias against saving and investment makes no sense. I’ll now have to mention that the beleaguered orchard owner also has to deal with 5,000 regulatory restrictions. A survivor shares her story. Unsurprisingly, Michelle Obama’s “hashtag” campaign from four years back failed abysmally to prevail upon the violent jihadist group Boko Haram to return the hundreds of Nigerian school girls who it abducted. And while the American media gave audiences the impression that this attack by militant Muslims against young Christian girls was a one-off, the truth is that Boko Haram has been conducting a reign of terror upon Nigeria’s Christian inhabitants for years. When men are included, the total number of victims of Boko Haram is estimated to be at 20,000.
Who will make Libya stable again? Despite the silence of the West, the Libyan wound still festers. Almost all international disputes for several years have been linked to the war in Syria, and other problem regions have been rarely recalled. Nevertheless, the conflicts have not ceased. One of the spots of tension is Libya, where now civil conflict is continuing. More precisely, it should be said that the chaos that NATO created in 2011 never ended. The collapse of the Libyan state order did not happen suddenly and did not appear as a continuation of the so-called "Arab Spring." It all started in the spring of 2011, when Libya was not ready for a strike. The question remains as to how much it could be ready at all. Will John Bolton finally boot Ben Rhodes's White House minions? John Bolton is reportedly set to clean house at the turmoil- and leak-ridden White House, still loaded with the worst of the Obama holdovers. For more than a year now, we have been hearing of Obama-era holdovers still holding jobs in the White House. And not surprisingly, there's been turmoil, with leaks stoking feeding frenzies for the Democratic operatives with bylines known as the press. 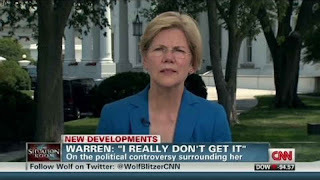 The latest example of this was in the annoying leak about President Trump refusing to take the advice of these holdovers about not congratulating President Putin for his re-election in Russia. That one not only could have been the work of leftover Obamatons, but also could have been the work of NeverTrump dead-enders or Bush loyalists. Like Obamacare promising lower health care costs and delivering higher ones, the Paris Accord promised lower emissions and delivered higher ones. There's nothing like central planning, is there? When a 10-year-old girl named Danianyeliz kneels down to drink water from a puddle, Liliana reproaches her, urging her to have a sip from a juice bottle they’ve just found in a garbage bag. California Wants to Secede? Let's Help Them! Hillary Clinton, A Bitter Vetch! PLO Boss Calls US Ambassador, "Son of a Dog"
'Check Your Privilege': Whom Are They Kidding? We're at War: But we're not waging it.